This is a true TGIF moment. Just chillin' with an enormous bottle of red wine and listening to some good music. My second life is good. And I've been working hard on a new ELEMENTAL JEWELRY release, so I deserve a break! 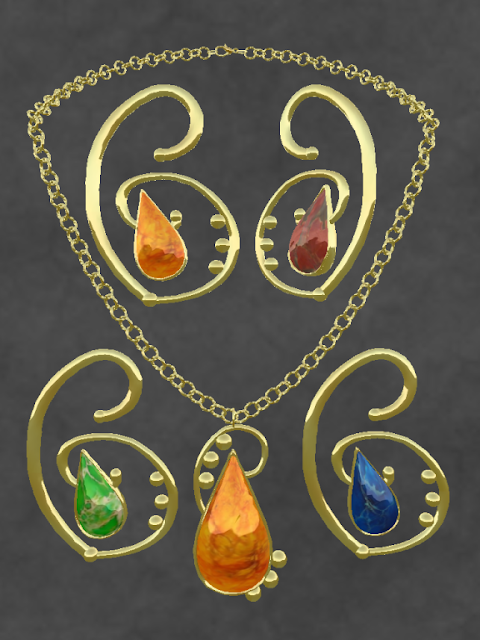 Pictured is the ELEMENTAL Amazon Gold Necklace & Earrings, a unique offering with texture changing Jasper stones in blue, green, red, and orange. Perfect for your colorful summer outfits! For the next week, these lovely jewels are at a special low introductory price! You can buy the Amazon Gold Necklace or the Amazon Gold Earrings separately for L$75 each. Or, if you want both, you can buy the Necklace & Earrings as a set for L$150. Stop by ELEMENTAL JEWELRY today to see this and many other beautiful jewelry selections. Pants: LeeZu Yve pants in hippie orange. I picked these up at the recent shoe fair, and I absolutely LOVE them! Shoes: G Field Knot Wedge Sandal in copper. Yep, found these at the shoe fair. I'm at: The Unicorn Cheese Factory at Happiness, in the treehouse venue. When you land at the tp point, be sure to click on the cd player so you can listen to the awesome original rl music of Hazideon Zarco. You might just want to take home a cd of your very own!